This morning the girls and I were messing about playing chess and talking about how great a Doctor Who chess set would be. We came up with this list of characters we would use for the two sets. 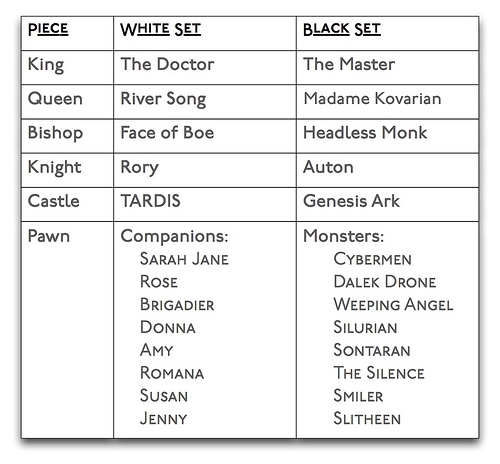 I’m sure there are already Dr Who chess sets available but this is our list. We were very conscious that our original choice of Queen (Mrs Wormwood or Miss Hartigan) is not ideal. Ideally the queen would be a female villain or monster who appears frequently. We’ve now changed to Madame Kovarian. Any suggestions for her or any alternative pieces would be very welcome. Edit: The original table was also updated to incorporate suggestions by James Thomson via Twitter.